Albert Martinez created a remarkable role playing King Anand, the good and respected King of Yangdon in the recently concluded hit royal-serye "Princess and I." Now, he will create another remarkable character as he portrays another exciting and extra-ordinary role! From a good and handsome king of a beautiful palace in Bhutan, Albert now portrays another king role. This time, he turns as the King of the Aswangs in the newest superhero fantaserye "Juan Dela Cruz"! Far from his character in "Princess and I," Albert in this newest teleserye is bad, killer, and antagonist. He kills people. He conquers with darkness and evilness! For him, "ang mga tao ay pagkain!" In the series, Albert camouflages himself as the rich businessman Samuel. He lives in wealth with his family - with his wife Zsa Zsa Padilla and his son Aaron Villaflor. But, he is aiming to dominate the world with darkness! At night, he turns to be a powerful monster! Albert is also the long-lost father of Coco Martin's character as Juan Dela Cruz. He didn't know that he has a son to the human and cross caretaker Amelia (Mylene Dizon). His real son is actually his mortal enemy! This is the great twist which makes the story of "Juan Dela Cruz" more exciting and far from the usual teleseryes we used to watch before! Playing the character of an aswang and a villain at the same time once more proves the versatility of Albert Martinez as an actor! 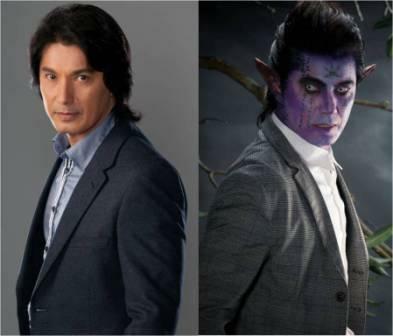 In the Kapamilya network, Albert already did different remarkable characters. He played as the powerful mayor Enrique in "May Bukas Pa" (2009), as a pirate captain and father of Princess Sarah in "Princess Sarah" (2007), as the head pilot in "Kung Tayo'y Magkakalayo" (2010), and as King Anand of Yangdon Kingdom in "Princess and I" (2012). This is also the second time that Albert and Coco play the character of father and son. Yes in 2010, Albert already played as father to Ringo (Coco Martin) in the hit Kimerald teleserye "Kung Tayo'y Magkakalayo." Coco in the said TV series was the son of Albert and Jacklyn Jose.